While you may known your friends and family members well enough to get them a gift that perfectly speaks to them, there are others in your life who are slightly harder to shop for. Surprise those outside your extended circle with the no-fail gift of a gift basket! Here are some holiday gift basket ideas for those in your life who deserve a special sentiment for the season. Chances are, you see your colleagues more than some of your friends and family members! Thank them for all of the support throughout the year with a coffee gift basket to help keep them fueled throughout the day. Does your business friend enjoy tea rather than coffee? Send a tea gift basket instead! 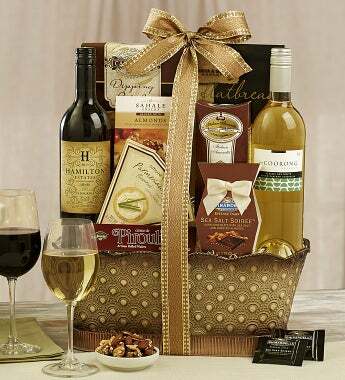 Toast to your significant other’s family with a festive wine gift basket! It’ll give you an excuse to stop by If you’re not sure if they prefer red or white wine, be safe and give a gift that includes both. They grab your mail when you’re away and feed your dog when emergencies arise; spread some holiday cheer to your literally “closest” pals by surprising them with a Meat and Cheese basketon their doorstep. Who knows, maybe they’ll even invite you over to indulge in the bounty! There’s no denying that taking care of children can be… stressful. Thank those who help protect and educate your most important gift – your children – with a gift that’ll help them melt their stresses away with a luxurious spa gift basket. Thank your local post office worker, garbage disposal associate or the helping hands that keep your building afloat (superintendents, doormen) with a juicy gift that’s sure to sweeten their season! 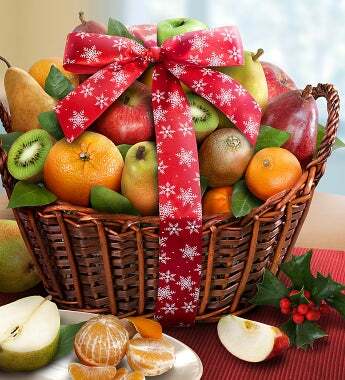 These holiday fruit gift baskets are sure to satisfy even the “pickiest” recipient! Far in distance but near at heart! Your friends and acquaintances may be more than a short drive away, but let them know they’re still at the top of your mind with an overabundance of festive sweet treat with one of the decadent dessert baskets from Cheryl’s. The holiday season is finally upon us! Do you know what that means? Holiday parties, family reunions, and of course – gifting! Our friends at Celebrations.com put together The Ultimate Holiday Entertaining Guide featuring festive foods, fun party ideas, creative decor inspiration, and a holiday gift guide to satisfy every type of recipient! What is your favorite way to entertain the holiday season? Do you fill your weekends with swinging holiday soirees? Or keep it casual with at-home holiday movie nights? Share how you celebrate in the comments below! What Would a Pilgrim Put in a Gift Basket? While 1800baskets has only been around since 2001, people have been gifting an assortment of gifts packaged into one unique gift holder for hundreds of years. With the Thanksgiving season in full swing, that really got us thinking – how would the ancestors of Thanksgiving fill their gift baskets? Taking inspiration from common pilgrim foods, activities, and celebrations, we put together some of the items we think you would find in a Pilgrim’s gift basket! Fresh fruit. Plums, grapes, and apples are traditional. Seasonal vegetables. Squash, corn, carrots, and more! Berries. Cherries, blueberries, and of course – cranberries. Tea. The pilgrims may have left England, but there are some traditions they couldn’t leave behind. Books. Reading material for the daytime or candle-lit evenings. Cooking utensils. You can always use an extra mortar & pestle. Sewing tools. An extra spool of thread is a must. Stationery. For writing to their families back home or loved ones in the next village. Beer. Popular in England, the pilgrims did not have the means to produce this age-old sip. Puzzles. An inexpensive and educational way to pass the time. Spices. Keeps food (primarily meat) fresher for longer. Candles. Illuminate a world without electricity. Words of Inspiration. Long work days and cold seasons with famine could use a touch of inspiration. Seeds. For planting or snacking on! Nuts. An easy-to-store snack full of protein and healthy fats! Fishing gear. Reel in the good times. Gardening gear. Gardening gloves are always in style (back in those days). Winter accessories. Gloves and mittens and scarves, oh my! Extra Wow Factor: Fresh Meat. They’ll really know you care. Did we miss something? Share what YOU think a pilgrim would put in a gift basket in the comments section below! 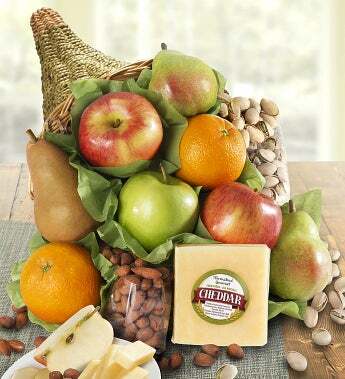 Together, we can come up with a wow-worthy assortment to impress even the most traditional settlers! Which Gift Basket Would You Choose? As always, I loved all of your Thank You Gift suggestions (and even better, some of you put down really great recipes and dessert ideas!). Clearly, whoever is lucky enough to receive a thank you gift from one of you is in for a special treat. And I have a few of my own gifts to send out! Congratulations to Cathy B*****y (July 13, 2012 at 12:01 am), Judy (July 17, 2012 at 9:08 pm), Amanda S (July 18, 2012 at 10:50 am), Shannon J. (July 19, 2012 at 10:16 am), and Pat (July 19, 2012 at 12:50 pm)! You will all be receiving our special All Smiles Gourmet Sweets & Treats Gift Basket! Please send your shipping info to me at amariscal@1800flowers.com and I’ll have your gift baskets sent out to you. As I’ve said, I love reading through all of your comments (and sometimes even look there for future blog post ideas!). One comment I saw made me think of a really interesting topic that (of course) I can’t wait to hear your thoughts on. When making or receiving a gift, do you prefer an all food gift or do you prefer a gift with reusable objects? I know this really depends on the occasion, but usually the rule of thumb is to stick with food gifts because you know they can always be used…or well, eaten. But sometimes when I get a gift basket full of my favorite things like new books, magazines, pens, and all corresponding items, I can’t help but love it more. And in a way, I think it says a lot that someone knew which things you would enjoy! But as I said, you can never go wrong with food. Sure it’s around every day, but there’s something extra delicious about a gourmet treat that someone specifically picked with you in mind. We have tons of gift baskets overflowing with delicious foods ready and on the go, but I definitely think our specialty gift baskets can hold their own! As far as new baby gift baskets, this adorable monkey gift basket is super sweet and will put a huge smile on mommy’s face. If you’re looking for a relaxing gift, our spa gift baskets are divine. Check out this Lavender spa gift basket sure to relax and soothe whoever is lucky enough to use it! Or if you’re interested in a more active way to relax, this trendy and ready to go yoga gift set is perfect (and comes with some great essentials for your workout!). Feeling a bit pensive? 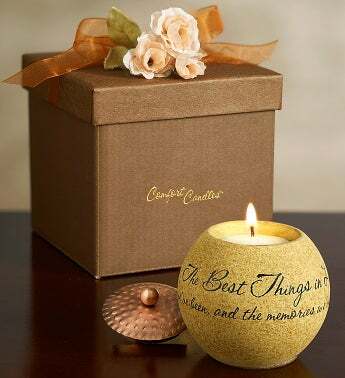 Our Thinking of You stationary gift basket is a real treat! Check out a review I wrote on this gift basket here. So what do you think? In the comments section (1-2 paragraphs) let me know which gift you prefer and why! FIVE lucky and random winners will receive a sweet prize next week. We have A LOT of names to get through today, so I’ll just go right at it! Congratulations to Jenny S (January 19, 2012 at 4:22 pm), Teresa Skinner (January 19, 2012 at 5:10 pm), Doris (January 20, 2012 at 9:00 am), Jill Kinney (January 21, 2012 at 12:10 pm), Bessie Louise Burnsed (January 23, 2012 at 11:27 am), Carmen Guajardo (January 23, 2012 at 11:54 am), Marie Lujan ( January 23, 2012 at 1:26 pm), Ben G (January 24, 2012 at 8:18 pm), Dorinna Wren (January 25, 2012 at 10:46 am), and Hank (January 25, 2012 at 3:00 pm! Send your shipping info to amariscal@1800flowers.com and I’ll get your Starbucks gift baskets out to you! Whew! Now that that’s settled, let’s jump right into Valentine’s Day! As a young girl in my 20s, I am pretty much obligated to enjoy Valentine’s Day and all the glitz and chocolates that come with it (which for the most part I do!). Personally, I could do without the color pink screaming at me from all sides (I’ve always been a blue girl myself) but man do I ever enjoy getting gifts or cards on Valentine’s Day. I like to think that this has been instilled in me since grade school when we would heavily decorate an old shoe box to house all the Valentine’s Day cards every kid in class was made to bring that day, and then read over the same “You’re cool!” message that was written by the people you liked once you got home (You’re cool, too Sean). Well, I don’t have a decorated shoe box on my desk now and only one person is really obligated to send me presents on February 14. But I’ve learned that the gifts do get a lot sweeter, literally. I’ve been really good about this vegetarian thing for January (almost a month through!) so I will have no qualms whatsoever about eating my weight in Valentine’s Day gifts on the 14th; Which is a good thing too, because I really can’t choose what I want more out of our Valentine’s Day collection. 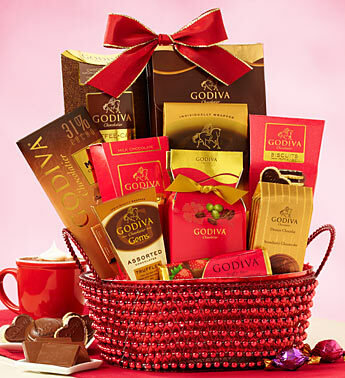 Our Godiva® Valentine’s Day chocolate gift basket is enough to make your mouth water just from the computer screen. 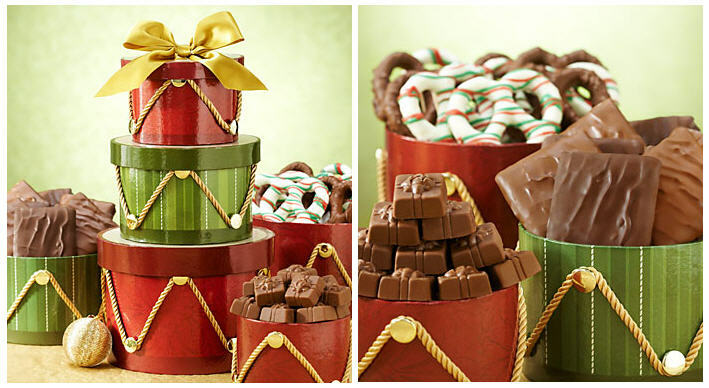 It’s packed with small chocolates, chocolate-covered pretzels, truffles, dessert bar, cocoa, confections and so much more. Also the basket is sincerely stylish enough to be used when it’s emptied. Our Valentine’s Day truffle cake pops have definitely had their own feature in my dreams. We had a version of them for Halloween and at least 5 were consumed by me in one day…I just couldn’t resist. Our real chocolate covered strawberries don’t need any kind of introduction, but it’s always good to know that they are decorated for the holiday with cute little red kiss sprinkles! Maybe you’re looking for a more relaxing gift? Our Imperial Cherry Blossom Spa gift basket is simply divine. I may be biased at the moment, because I’ve just recently discovered how much I love salons and spas now that I received a Christmas gift to go to one, but this gift basket is filled with all sorts of extravagant and indulgent gifts. There’s a spa mitten, sponge, body lotion, sugar body scrub, body oil, exfoliating shower gel, and much more! It’s the perfect Valentine’s Day for someone who needs some relaxation. Since it’s not February yet, I need to go back to staring at pictures of salads and wait for the day when I can go into a sugar coma and wear sweatpants for the rest of the week. But FIVE of you lucky commenters will be able win some sweet Valentine’s Day treats early! In the comments section (1-2 paragraphs) tell me what was your favorite Valentine to receive? Five lucky and random winners will receive the Godiva® Valentine’s Day chocolate gift basket! Welcome back gift baskets readers! A really great post coming up (not bragging about me, just the topic! ), so I’ll get to things right away! Congratulations to Howard Y. (	December 8, 2011 at 5:41 pm), Starlet Borzymowski ( December 9, 2011 at 8:02 am), Joy B. ( December 15, 2011 at 10:48 am), Swisspotluck ( December 10, 2011 at 6:21 pm), and Swisspotluck (December 10, 2011 at 6:21 pm)!! Email your information to amariscal@1800flowers.com and we’ll get your Comfort and Joy Sweet Treats Gift Basket to you right away! I’m going to take a little break away from talking about gifts, décor, movies, and the inevitable snow storm that will make my morning commute 10x more hectic. Instead, I want to talk about an extremely cool project that the 1800baskets.com team participated in. We decided to partner up with local Chicago fund, Chicago House & Social Service Agency. Chicago House has been a leader in housing and supportive services for people living with HIV and AIDS, with programs that expand beyond housing to encompass a variety of services designed to help people living with HIV and AIDS move towards independence and self-sufficiency, including prevention, medication adherence, and employment programs. The Chicago House organization is by far one of the best non-profit programs out there for helping those in need. Their residential and scattered-site housing programs create stable housing, a Family Support Program offers housing, case management and other support services to 18 families, including over 30 dependent children, and works intensively with both parents and children to stabilize their lives and help break the cycle of poverty. They work intensively on education and support for those living with HIV and AIDS; awareness and prevention initiatives, medication adherence programs, community case management and work support programs only scratch the surface of everything this organization has to offer. A few of us on the team with all of the donations! 1800Baskets.com has even partnered with their employment initiative business, Sweet Miss Giving’s bakery, a for-profit bakery that provides transitional job training in addition to donating 100% of its profits back to Chicago House. 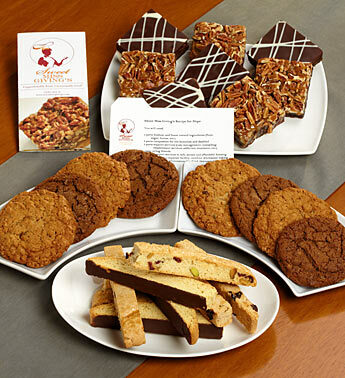 You can find their bakery items (here) to order! A sweet treat supporting an even sweeter cause. And from personal tasting, the turtle brownies are the only brownies I ever want to eat for the rest of my life. If I could eat them every day without giving myself early on-set diabetes, I would. This holiday season, we knew we wanted to help out even more. For the beginning half of the month, we ran a donation drive in our office to collect personal hygiene items, winter gear like coats, gloves, hats, scarves, and games for families to play together. We ended up with way over 1000 items! (And my arms ended up with some muscle definition from carrying…) As a gifting company, our main objective is to make our customers smiles, but this was a whole other level! For the rest of the season (and really the year), think about ways that you can give back to your community or help those in need! Maybe find “two for one” deals while you’re out grocery or everyday shopping and just set things aside as you go along to make the donation process easy. Sort through your closets or attics for things you just don’t have a need for anymore. Get yourself a delicious treat at Sweet Miss Givings and put those calories to a worthy cause (if it’s for charity, I hear all brownies are 0 calories)! In the comments section (1-2 paragraphs), tell me what your favorite charities, any charitable moments you recall, or any charitable programs that you always work with. We’ll be giving FIVE random winners a Sweet Miss Givings Bakery gift box! 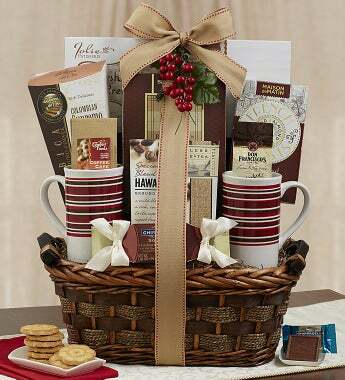 Christmas Gift Baskets, Customer Appreciation, Feedback, Gift Baskets, Gift Baskets Catalog, Holiday Gift Baskets, Party! Did everyone survive Black Friday and Cyber Monday? I need my readers safe and in tact! I hope everyone had a fantastic Thanksgiving holiday and ate until you couldn’t tell the difference between any of the foods you were eating anymore (that may have just been me). It’s December 1st, so now I can finally talk about the Holidays without a twinge of guilt for infringing on any other holiday’s placement! Of course, I have to prioritize, so insane list of Christmas activities will have to wait for a second. This first week is all about Christmas decorations for me. I’ll be getting out the snowman cookie jar, red table mats, my sad little table sized Peanut’s Christmas tree, an unnecessary amount of lights, and of course I’m sure I’ll be finding tinsel on me for the next 3 weeks. Our Holiday gifts section will probably come into play at my house, seeing as our gift baskets are both food and cute holiday decorations all rolled into one (bow tied) package! I know my mom is going to like the Regal Drum Gift Tower, filled with Harry London® chocolate treats inside. 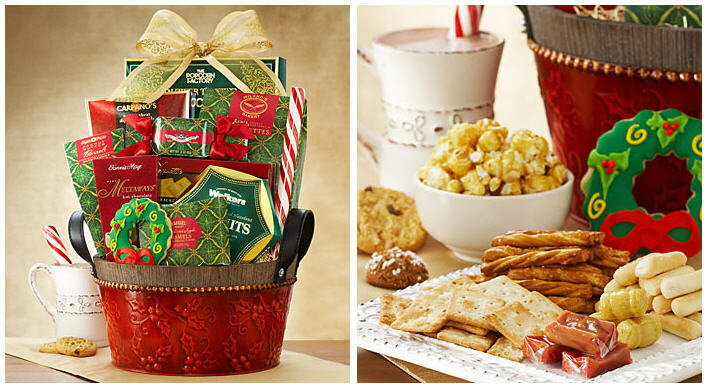 An 1800Baskets.com Exclusive, this charming and festive gift set is perfect for quick decoration with yummy gifts inside, like milk chocolate covered pretzels, mint chocolates, chocolate covered grahams, and more! We also have the beautiful Festive Red Holiday Sleigh Gift Basket, a holiday must-have of chocolates, pretzels, snacks, and sweets all delivered in a solid sleigh basket! I have a few hours of shopping in Target and Pier 1 ahead of me, so in the comments section (1-2 paragraphs) tell me some of your Holiday decorations or things you’re excited for! You can even quote your favorite holiday movies to me and I’ll be happy! FIVE lucky winners will receive the Regal Drum Gift Tower!